We are Roundabout Quilters, and we are a group of like minded individuals who meet to discuss, learn about and share all things relating to patchwork and quilting. We meet on the 2nd and 4th Tuesday of each month, except August. Each month there will be one evening with a speaker and one evening for sewing and all meetings will run from 7.30pm to 9.30pm, doors open at 7.00pm. As well as the regular evening meetings we occasionally offer some workshops which are run during the day. Details can be seen on the 'Programme of events' page. Group news and our blog can be found here. Membership of the group is open to anybody with an interest in patchwork and quilting. The annual fee will be £40 pa for the full year which runs from September to August. If you join part of the way through the year the fee will be worked out on a pro rata basis. Visitors are very welcome to come to any of our evenings but there is a charge of £5 when we have a speaker and £3 for a sewing evening. Workshops are an additional charge. If any members would like to be help out with the committee, we would love to hear from you - have a chat with any committee member for more information. Our meetings will be in the Carnival Hall, in Basingstoke. There is plenty of free parking and there is disabled access to the building. 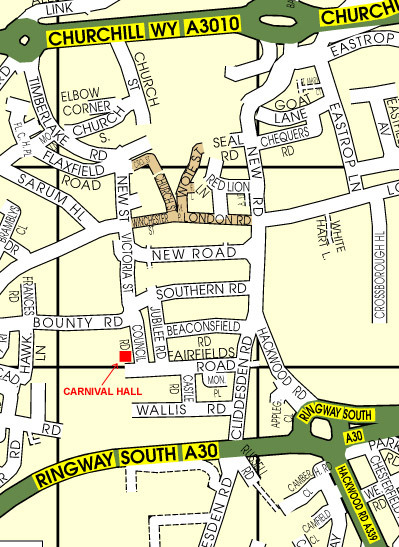 The address is Carnival Hall, Council Road, Basingstoke RG21 3DH. The Carnival Hall is situated in the centre of Basingstoke. Please feel free to contact us if you require more directions.